Klayman: Netanyahu Must Overcome Past Weakness to Now Totally Destroy Hamas! Tough Talk Is No Substitute! Gaza militants launched at least 10 rockets Monday evening in their latest barrage of fire after Israeli forces struck key targets including the offices of Hamas leader Ismail Haniyeh. 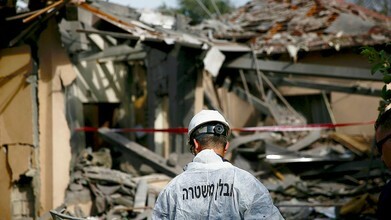 The barrage of rockets from Gaza hit Israeli towns around the border, including a house in the town of Sderot. No one was injured. Sirens could be heard wailing in southern Israel amid the latest rocket fire. Israel's strikes had come in response to a rocket attack from the Palestinian territory earlier Monday. It also came amid a bolster in Israeli troops and rocket-defense systems ahead of what is expected to be a new round of battle with the Islamic militant group.